For our American friends – how was Thanksgiving? I hope you had a good time with family and friends and that you aren’t suffering from food coma this morning. 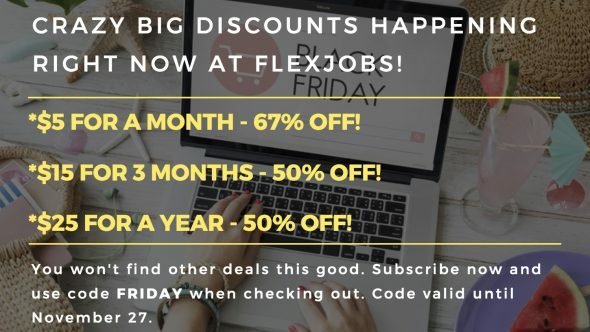 Even if you are, though, I’ve got a feeling you’ll snap right out of it when you see Flexjobs’ Black Friday sale. $5 for a month – 67% off! $15 for 3 months – 50% off! $25 for a year – 50% off! The code is valid till Monday, November 27. I hope you all woke up NOT feeling the mid-week blues. If you did, today’s jobs – especially the online writing jobs – should brighten your day. Do you have the mid-week blues? I hope not, but in case you are, these jobs should give you a little boost.